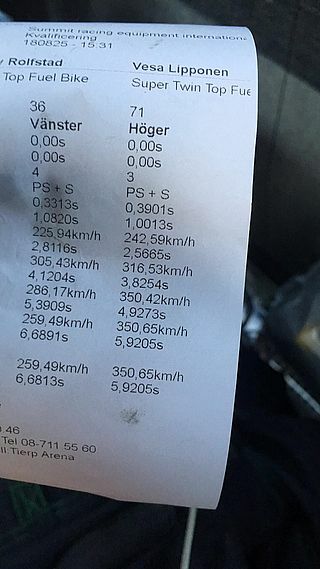 On Saturday, August 25, 2018, at about 3:30PM, local time, at Tierp Arena in Sweden, Vesa Lipponen of Truku, Finland ran a 5.9205 elapsed time @ 350.65Kpm (217.88 mph) to officially run the first ever 5 second elapsed time in the class of Top Fuel Twin. He did this while racing in the EDRS, the European Drag Racing Series, during the Summit Racing Equipment International event, held August, 23-26. 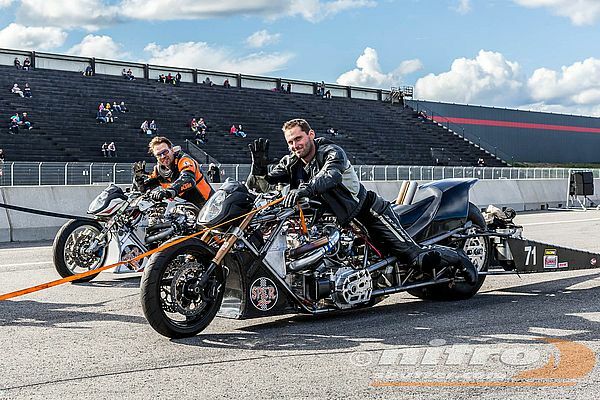 The 31 year old Finish drag racer has been racing drag bikes for close to 8 years now. Vesa recently helped complete this build with his good friend, Jaska Salakari, who is the prime architect of this historic drag bike. Vesa’s bike is for the most part a clone of Jaska’s famous drag bike. The Salakari motor is 103 CID, direct drive, no transmission, sporting a screw-type supercharger built into the engine cases which also house the clutch/drive assembly. The frame is also by Jaska. “This run was only my second full pass on this motorcycle” he stated in an over-seas interview, shortly after his historic run. “We had a soft set-up in it” he also commented. The basics of the tune up were as follows: 43 PSI of boost, 84% nitromethane, fed into a 1687 cc two cylinder drag bike. The results were, a 1.00 60’ time, 3.825 @ the eight-mile, and this culminated with a 5.9205 elapsed time @ 350.65 Kph or 217.88 MPH. “If we can find the funding, maybe we come to America and run the Man Cup World Final race in November.” Not to be out done, in the final round of qualifying, Jaska Salakari, of Vanta Finland, unleashed his personal best, a 5.83 @ 206.74 MPH to become the #1 qualifier and the second man in drag bike racing history to run a five second elapsed time in Top Fuel Twin. 19 Super Twins battled it out for an 8 bike qualified field, eliminations will take place on Sunday. Special Thanks to Mike Kraaij of Amsterdam, Jaska Salakari and Vesa Lipponen for their contributions to this report.